Built in 1840, a large, two-story brick home in Madison, Ind., maintained its original slate roof. 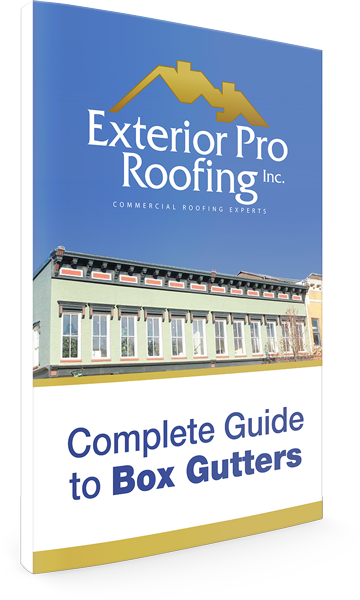 In addition, typical of homes built in this time period is a feature called a box gutter—a form of open gutter most often supported by decorative cornice and sheet metal work. When the homeowners began to notice leaks inside the home, they called Exterior Pro Roofing. 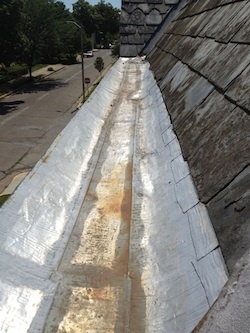 The box gutter was leaking, and therefore letting water into the masonry wall. The result: damage to the home’s exterior paint, as well as interior walls and ceiling. Several sections of the slate roof had broken loose, exposing the wood deck to all forms of precipitation. 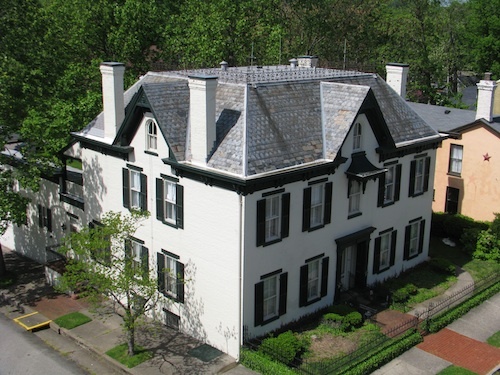 To maintain the home’s historic nature, Exterior Pro Roofing created a plan to replace the broken roof sections and line the box gutter with Duro-Last® single-ply membrane—eliminating leaks and protecting the sheet metal against rust. First, our team worked closely with the homeowner to secure replacement slate roofing tile that was period correct in age, size and color. We started the project by dividing the home into sections around the roof corners. One two-man crew would work on one side of a corner, while another two-man crew would work on the adjacent side. By design, they would meet at the corner and tie into each other’s work. We set the goal of finishing one section per day, and then tearing down and setting up the scaffolding for the next day’s work. This way, our crews could get right to work on the roof repairs while they were still fresh each morning, rather than worrying about setup. The system worked exactly as planned, and we finished the job without problems. We even replaced the old gutter spouts to help prevent future drainage problems. 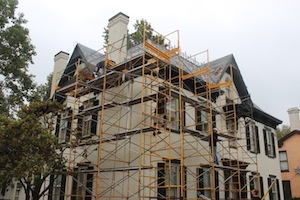 The repairs guaranteed that this historic home would grace downtown Madison, Ind. for many years to come.